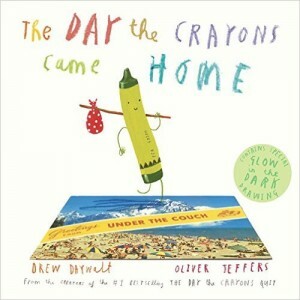 Duncan’s crayons quit a while ago, but now they are headed back home. Well, some of them are supposed to be headed home. The title is a little confusing on this issue and kids will catch it for sure. One crayon is upstairs in Duncan’s room stuck to a sock, and one is down in the cushions in the couch. Another is standing in the hallway of Duncan’s house waiting for someone to open the door. The first and last pages of the book are in normal font. However, as in the previous book about these crayon characters, the postcards supposedly written by the crayons are going to be hard for some children to read. They are in kid-like scrawl and in various colors. Otherwise, it is a silly, fun kind of book destined to get giggles galore from young readers themselves and lots more when a literacy teacher or librarian reads it aloud. It would be great to use with older students when talking about character development. Writing curriculum standards will be met using this as discussion starters also in discussions of fact versus fiction and setting. Art projects depicting crayons in touch conditions will be fun follow-up activities for classroom or story hour.